Today’s conventional wisdom says that kids are too stressed out by the burdens we parents are placing on them, and we need to help them relax. Maybe that’s true for the tiny sliver of students who attend hothouse high schools in the bubbles where many of us happen to live. But for America at large, it’s exactly the wrong advice. We need the majority of parents and kids to be more stressed out. We need to shake them out of their complacency and tell them: You and your kids are heading toward a coming-of-age catastrophe, but you can avoid it if you act now! I’m referring to the fact that only about one-third of American teenagers leave the K–12 system ready to succeed in postsecondary education. 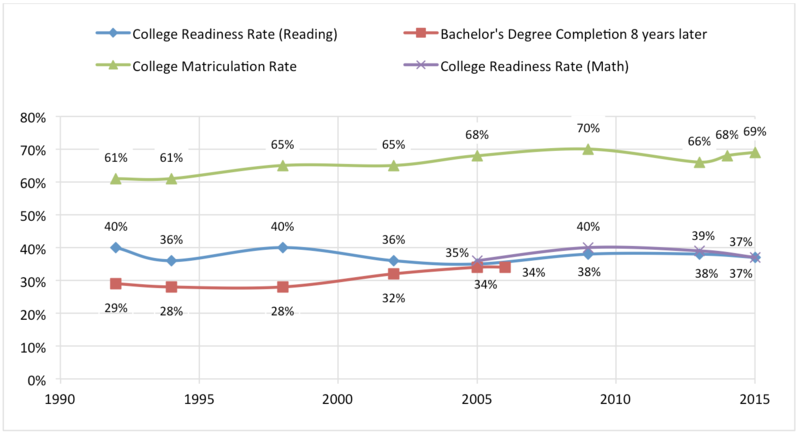 Another third go to college unprepared, where they hit the brick wall of remedial coursework, and many of them—including almost all of the low-income students—drop out. That amounts to more than a million kids a year seeing their dreams dashed before they are old enough to legally drink a beer. *2005 marked the beginning of a new NAEP assessment framework for math. That’s tragic enough. What’s worse is that neither these young people, nor their parents, see it coming. Yet “we” know—we policy experts, we school district leaders, we state officials, we educators. We can see it, clear as day, in the data, starting as early as the sixth grade. We know with reasonable precision which students are likely to leave high school ready for college, and which are not. We just don’t bother to tell the families. Don’t believe me? In the states that contract with SAS to manage their accountability data—including Fordham’s home state of Ohio—teachers, principals, and superintendents can see a projection of a student’s ACT score as early as the sixth grade. Any district using NWEA’s MAP exam can receive the same via a nifty tool. Equating any standardized test score result to an ACT or SAT projection is reasonably doable. This is a straightforward use of the type of “predictive analytics” sweeping across so many fields. And while college readiness is about much more than test scores, it’s also the case that low test scores will keep you out of the best colleges, and land you in remedial education. The point is not to peer into an unalterable, deterministic, or predetermined future, or to tell kids or their parents that they are destined for failure. Rather, it’s to change the future. Just like doctors must deliver stern warnings to the parents of obese children—help them lose the weight or else diabetes or worse lies ahead—educators must be prepared to deliver stern warnings about educational underperformance. In both cases, the hope is to alter behavior. I’m now convinced that this lecture probably has to come from someone who parents trust—one of their child’s educators. I was hoping that wasn’t necessarily the case. I wrote last year for Education Next that it might be interesting to test out an online tool that delivered this news directly to parents of middle schoolers, early enough that they could do something about it. They could enter their child’s test scores into a website; it would spit out an ACT projection and list the types of colleges their kid might be able to get into. For many children, the news would be disconcerting, as it would predict remedial education in the offing. This might catch parents’ attention and spur them to action. We at Fordham decided to give it a try, so a few weeks ago our partner, the Gigawatt Group, held focus groups in Columbus to test it out on middle-school parents. It was not encouraging. Unsurprisingly, parents hate state standardized tests, but what they hate even more is the notion that test scores could tell them whether their children are on track for college—especially when their kids are still so young. These moms and dads would eventually concede that it would be interesting to know what ACT score their kids are likely to receive, since colleges do in fact consider these scores in admission decisions. But they really want to be able to talk all of this over with their kids’ teachers. Furthermore, they put very little stock in test scores alone, whereas they completely trust the feedback they get from school. If their kids’ report cards are full of As and Bs, and their teachers tell them at parent-teacher conferences that everything looks good, that’s what they are going to believe. They don’t know what “we” know—that the vast majority of kids in America get As and Bs, whether they are on track or not. There’s time to catch up, but not much time to waste. She needs to be putting more effort into her homework, and should think about signing up for tougher classes next year. You can also help her at home. One great site is Khan Academy, where she can view online lessons that are pinpointed directly at her challenge areas. Let me stress that, at her current trajectory, she is likely to either not get into college, or get in and struggle. We need to change that trajectory! For educators out there: Are schools already doing this? What would it take for them to embrace this role? Do we need to pass laws mandating these kinds of annual check-ups? And for the rest of us: Let’s keep brainstorming ideas to share the hard truth with parents and kids. Many American teenagers are simply not working hard enough. They would work harder, and smarter, if we asked them to. A shot at the American Dream is at stake. Let’s not waste it.